Hello, I am Captain Chris Robinson and I would like to welcome you to learn more about Big Kahuna Charters and a day on the flats or in the backcountry. I have lived in Key West and fished Florida’s lower keys for 40 years and have been a full time licensed and insured charter captain for 23 years. I fish on the flats and in the backcountry from the Content Keys to the Marquesas Keys. Big Kahuna Charters’ home base is 21 miles north of Key West at Cudjoe Gardens Marina; however, I can trailer the boat into Key West. From Cudjoe Key, in less than twenty minutes, we are in the beautiful backcountry of the Great White Heron Refuge. Permit, Bonefish, Tarpon, barracuda, shark and cobia are abundant in this area, either on the flats or in the channels. 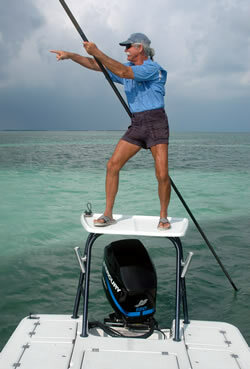 I also have an in depth knowledge of the eco system in the Florida Keys. Our charter may possibly include encounters with turtles, dolphins, spotted eagle rays and other sea life. People who have charted with me range from the most experienced angler to the novice angler. Anglers may choose fly, spin or conventional tackle. I will talk to you in depth prior to your reservation, making sure we have all the gear you need for your fishing preferences. No matter what your skill level, my goal is to leave you with a fishing experience you’ll never forget. So, I invite you to move around my site. Enjoy the picture gallery and testimonials, get to know the fish we will catch and release, check out the frequently asked questions and finally go to reservations and rates so that you can schedule a great day of fishing. If you have any questions please call or email me at chris@bigkahunacharters.net, I’ll get back to you as soon as I can. To The Call of the Wild!